1. The name of this branch of the Industrial Workers of the World shall be Philadelphia General Membership Branch (GMB). of Delaware, Chester, Bucks and Montgomery Counties, unless any of those counties reaches membership enough to form their own separate branch/es. 3. These bylaws shall be made available to every Philadelphia IWW member as soon as possible upon initiation. 2. Members are subject to all constitutional provisions set forth in the Constitution most recently ratified and amended by the membership of the Industrial Workers of the World. 3. The Branch Secretary shall be responsible for providing a current membership list to any member in good standing who requests it unless individual members request to be unlisted. 4. Membership in the Philadelphia Industrial Workers of the World shall be restricted to those who do not have hiring or firing power over another worker. 4.1 Firing power is defined as the formal or institutional authority to determine the continuation of another worker’s employment status or primary income. 4.2 Any decision rejecting membership shall be announced at the next general meeting. If there are any members who disagree with the decision to withhold membership they can appeal by moving to vote on the application in dispute. A quorum of members can decide with a simple majority. If there is not a quorum present, the motion shall be tabled for a future general meeting. In the event of a tie, deliberation will continue until a majority can be reached. 1. The branch shall elect a Branch Secretary, Branch Treasurer, Archivist, Member Delegates, and Convention Delegates. 2. Philadelphia GMB may create and elect any other officers by proposal and vote, and each additional officer shall be subject to the provisions of this article. 3. 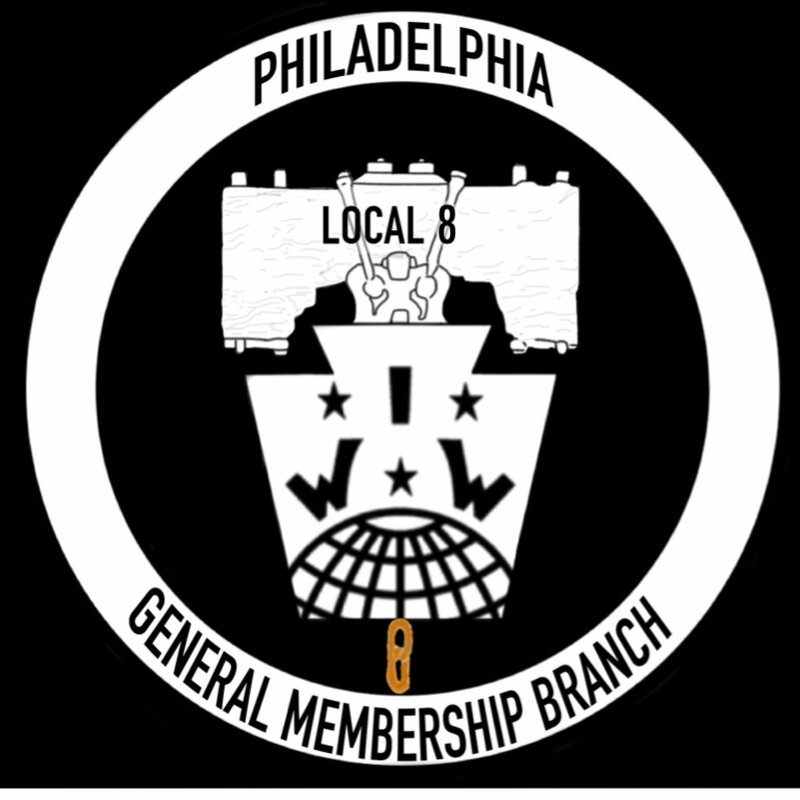 All officers and delegates must be members in good standing of the IWW Philadelphia GMB. If any officer falls more than four months behind on their dues, they shall be given the option of catching up or being replaced. 4. Elections for branch officer positions will be held annually, in June. Elections will be conducted by regular vote at the regularly scheduled branch meeting. Elections will be announced at the branch meeting two months prior to the election and at the branch meeting one month prior to the election. This announcement will be included in the minutes of those meetings. Announcements of the election will also be emailed to each eligible voter, at least one month prior to the election. 5. Eligible voters shall include all members in good standing of the IWW Philadelphia GMB. The records of the Branch Secretary will determine voter eligibility. Members in good standing who are not able to attend the business meeting when the election is to be held shall have the right to vote by proxy for any eligible candidate, provided they give their vote in writing, by email, or by fax to the BST by the day before the election. 6. Any branch member in good standing can nominate another member, including themselves, to GMB officer positions at any business meeting. Nominations require a second but do not require a vote. All members with seconded nominations shall be considered in the election. -Branch Secretary: Maintains a record of meeting minutes, including a written record of meeting decisions and proposals. Helps draft communication with members, potential members, and supporters. Also responsible for checking the IWW Philadelphia official voicemail and email accounts. The branch Secretary is also responsible for submitting annual DOL and IRS filings. Attends monthly and special meetings of the IWW Philadelphia GMB whenever possible. -Branch Treasurer: Responsible for producing monthly branch reports, collecting monthly delegate reports, distributing branch funds, submitting financial reports to GHQ and the branch membership. The Branch Treasurer is also responsible for upkeep of the branch bank account. Attends monthly and special meetings of the IWW Philadelphia GMB whenever possible. -Archivist: Keeps a file of all printed organizing materials from the Branch. -Member Delegates: (see also the IWW Delegate Manual) Signs up new members, takes dues, maintains regular contact with members and other fellow workers and attends monthly meeting of Delegates Committee, which submits reports and dues to the Branch Treasurer monthly – preferably at the Delegates Committee meeting or the meeting of the GMB. As many delegates are elected as needed (preferably one delegate per 10 members). Attends monthly and special meetings of the IWW Philadelphia GMB whenever possible. -Convention Delegates: Represent the will of the branch at the Annual IWW Convention, usually in September. The Convention Delegates are to be elected in June of each year, and the number of Convention Delegates elected is contingent on branch numbers and the specifications provided by the General Executive Board. Convention Delegates do not have to be Member Delegates as previously specified in this section. 2. Officers elected on an annual basis shall serve 12 months from the date of their election. 3. Terms are limited to two consecutive terms for every officer position, with the exception of Member Delegate and Archivist positions. The Archivist will have to run for the position of Archivist every year, but the Archivist will not be restricted by term limitations. 4. Unfilled positions may be assigned to willing volunteers at a regular scheduled branch meeting, confirmed by a majority vote. Special elections, referenda, ratifications, and recall elections may be called for by any eligible voter willing to give proper notice to all eligible voters. These will take place at the next regularly scheduled monthly meeting and will be confirmed by a majority vote. 5. All elected roles are accountable to the membership, their decisions, and branch bylaws and are subject to progressive discipline up to and including recall. location can only be made by unanimous agreement of the branch officers, and the membership should be notified as soon as possible. 2. Rusty’s Rules of Order shall be used to organize decision-making. 3. Meetings must be publicized to members by email and preferably also by face-to face contact and telephone at least thirty (30) days in advance. 4. Not less than five members shall constitute a quorum for the transaction of business by the General Membership Branch and its recognized committee(s) (except in the case of three person committees). The transaction of business includes official motions and the disbursement of branch funds over $30. Any paid officer of the IWW shall not count as a member for the purposes of quorum, in keeping with the IWW Constitution. 5. Voting: The outcome of all votes during a general monthly meeting will be determined by a simple majority. Bylaws can be changed by a simple majority vote of branch members in good standing. Proxy votes may be provided in writing (typed or handwritten) to the member’s Delegate or Branch Secretary and must be signed and dated along with the member’s X number. It is the responsibility of the Member Delegate or Branch Secretary to follow up by at least email, or preferably phone or face to face, and confirm with the voter Their vote before the vote is to take place. 6. Per Article VII, bylaws can be changed four times a year (once per quarter) at any regular membership meeting in a given quarter. 7. A monthly Delegates Committee meeting shall be held for the purposes of submitting reports & dues, sharing information & organizing any other activity as directed by the GMB. The Delegates Committee has no power to make or overturn policy and/or decisions made by the GMB. 8. Emergency Meetings: In extenuating circumstances, an emergency meeting can be called by a minimum of 25% of branch membership including at least three current members of the branch and one officer. 48-hour advance notice to membership must be provided by those calling the meeting. All regular meeting rules apply. 1. Voluntary payments, donations, and assessments are welcome and must be accounted for, as must any other funds. 2. Branch accounts shall be available for inspection and audit by any branch members within one week of request. 3. The fiscal year shall be from July 1st until June 30th. 4. In July there shall be an audit and report of the branch treasurer for the previous fiscal year. Three IWW members, either inside of the branch or outside, shall be elected by a majority vote of the branch to conduct the audit. A strong preference for auditors inside the branch should be exercised. 5. The Branch Treasurer will be authorized to disburse funds less than $30.00 at their discretion. These disbursements must be included in the Treasurer’s monthly financial report. 6. Irregular disbursements in excess of $30.00 must be approved by a majority of branch members at a regularly scheduled meeting or publicized special meeting. 1. The branch can create and amend branch policies other than bylaws by the simple majority of the branch at any regular monthly business meeting. The Branch Secretary shall keep an up-to-date branch policy document containing all current branch policies. This document shall be given to any member in good standing on request. 2. Changes to Bylaws: Bylaws can be changed four times a year (quarterly) at any general membership branch meeting. Please refer to Article V “Meetings” for further details on voting procedure.